On this particular site, WordPress is used to power the entire site including a blog area that exists as a sub page (i.e. /blog/). Template files that specifically had to do with the blog area needed a special header area for the blog, whereas other page templates did not. This could have been solved with some elaborate if/then logic in the header.php file, but I found it more intuitive to create a special file with this "Blog Title Area" and include it on the template files that needed it. Whereas the search.php, 404.php, and page templates do not. Underneath the Post tiles on this site was a red bar with information about the post. The data posted, the author, the categories, the number of comments. Otherwise known as "meta" information about the post. This same exact "metabar" is present on a number of the different template files. 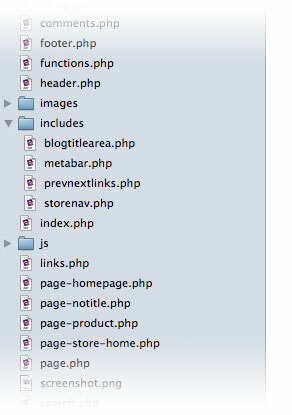 For example, the blog home (index.php), the category views (archive.php), and the individual Post pages (single.php). The bit of code that was creating this bar was beginning to grow rather complex. For example, on one particular category I didn't want to show it, and there are just a lot of PHP functions needed to gather all that data. I bet you guys know what these are! Those links that show up on all kinds of template pages to allow for navigating posts backward and forward in time. These are commonly found on the blog home page, search pages, archive pages, and even sometimes individual post pages. If they are exactly the same on each, why not include them from one central file? On the particular site I was working on, some of my page templates were specifically related to a "store" area of the site, so those needed to use my special "storenav.php" include. Do you guys ever use this technique? Are there other things you can think of to use this fine-grained include approach on? Nice. Didn’t think of it that way. Somewhat like CSS, where you can make the changes in one place, yet apply only the changes where the code resides. Thanks! Hi Chris, if I understand what you’re doing, I use this same method on non-WP sites as well, and find it very effective. I’ll include meta info, page titles, and my standard css/script header info, plus the usual nav and footer and any other reusable sections. I’ve wondered though if this has an effect that i haven’t noticed on http requests? Oh yeah absolutely, includes aren’t in any way WordPress specific. I was just pointing out a few areas in typical WP themes that don’t use includes that probably could to make things smarter. And no, this won’t affect http requests. PHP includes are handled server side. Great, good to know – I am just getting into WP in detail, so this is good to know it applies here as well! Maybe I’m missing the point but I’m not sure how includes like these actually make things “smarter”? I’m not a PHP programmer so I only have a elementary understanding of what’s going on, but I see includes to just mean more work on my part. Wouldn’t it be easier to simply the template files by grouping template code as they are now? I could see includes helping when documents get lengthy, sure, but most WordPress template files aren’t very lengthy. I guess the way I see it, you could make every bit of code into an include, but that means finding a certain piece of code might take longer than you want since you have so many files to search through for this particular piece of code. The prevailing logic is DRY (Don’t Repeat Yourself). If you have an area that is EXACTLY the same in multiple places, you are doing it wrong. When the time comes (and it will come), that that area needs to be changed, by using includes are are ensuring it only needs to be changed in one place instead of many. Alright, so you mean multiple places in multiple files. I understand now. Thanks! Just never thought of doing that for items. Definitely going to make a change to my stock starting theme (my own variation of starkers) to use includes on for the meta bar and next previous links. I’ve externalized (is that a word?) some of the more complex bits of content I call a lot, but I’ve never really thought to do the same to the more common areas. Will probably give it a go on my next project! Wow… I’ve been using this technique a lot, because I’m building a big magazine website and we have a lot of areas that appear in various places. Cheers, did this only with search form. This is definitely useful in large themes. I have been chopping my wordpress themes this way for a while now. I have gone as far as putting “the loop” into its own include. I find it to be a very effective way of managing my themes. I think That if you are going to do this it is a great idea to put all of your includes into a separate directory like Chris has done here. If you don’t your theme folder can get pretty balloted. I forgot to mention that this is also a great way to incorporate a custom jquery slide show or other custom snippet as well. It allows you to drop a slide show or custom bookmarks for example, any where in your theme. Are you referring to one of our downloadable themes or the site itself..? the categories and archives are broken on the site itself in IE 8 and lower. works fine in FF not sure about any other browsers. This is a nice idea however wouldn’t too many includes cause the page to take longer to be delivered to the end user? Thanks Chris, your tut is simulating ‘modular programming’ and an old programmer like me has used this concept for years in various technologies and in my opinion is definitely the way to go, especially when you find yourself beginning to copy/paste the same code in different source files, it becomes a maintenance nightmare. Much easier to have a repository of modules/snippets/includes/classes that can be reused and managed centrally. And great idea moving to DigWP.com, that’s an awesome domain (why didn’t I think of registering that? ), I always thought the previous one was too long. I used to do this “including” all the time before WP and will again while using the Hybrid theme. I do it both in specific template files as well as using conditionals to decide which include to use. The simplest use is figuring out what goes in a sidebar based on the category of the post. I plan to do much variation in the sidebars, but I may use the “who sees ads” plugin.